Shingles (also called herpes zoster) is a painful, itchy, blistering rash. It is estimated that one in four people will develop shingles in their lifetime. The occurrence and severity of shingles increases with age. 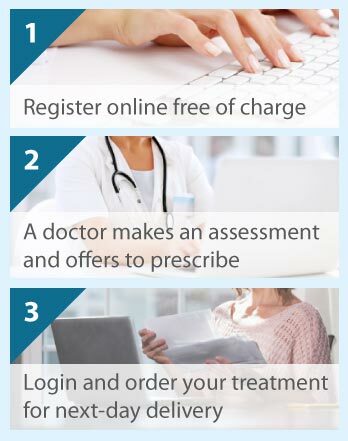 The Online Clinic can prescribe Aciclovir for Shingles. A diagnosis is done online from a photo of the affected area of skin. Please click on the Free Consultation button below to begin. Shingles is caused by reactivation of the chickenpox virus (varicella zoster). Once you have had chickenpox, the virus enters clusters of nerve cells associated with the spinal cord or neck and head nerves where it remains dormant often for many years. When reactivated, the virus multiplies and travels along the connected nerve fibres to the skin; shingles affects the skin area supplied by the affected nerve fibres. What precisely triggers reactivation is unknown, but it is thought to be associated with a compromised immune (defence) system, which protects the body against infection and disease. Shingles cannot be caught from another person with either shingles or chickenpox. However, the shingles blisters contain active virus. The virus can therefore be transmitted from a person with shingles to individuals who have never had chickenpox, thus causing chickenpox. Shingles only develops in people who have had chickenpox. Shingles is most likely to occur in older people, and individuals who are under stress, have a weakened immune system, or are using treatments such as steroids or chemotherapy that suppress the immune system. Shingles is generally one sided, usually occurring on the side of the body supplied by the affected nerves. Shingles usually starts with pain and abnormal skin sensations in the affected skin area. Headache, light sensitivity, generally feeling unwell, and sometimes fever may also occur in the early stage. This is followed by patchy red skin and the appearance of a rash comprising fluid-filled blisters. The area slowly dries forming crusts and scabs, which then drop off; scarring may occur particularly if the scabs are picked. The affected skin area may be severely painful, accompanied by tingling or numbness, and extremely itchy. The rash typically lasts 2-4 weeks. After the rash, some individuals experience persistent or recurring pain (post herpetic neuralgia [PHN]) at the affected site. The severity of PHN pain varies and usually lasts 3-6 months, but can last longer. The skin area tends to be very sensitive to pain, which may be triggered by any stimulation. Generally, people who are older or are affected in their upper-body are more likely to have PHN. Complications can arise, the type depending on which nerves are affected. These include ophthalmic shingles if the eyes are affected; hearing loss, dizziness, tinnitus and face paralysis (Ramsay Hunt syndrome) if head nerves are involved; and rarely inflammation of the liver, lungs, and brain. Diagnosis of shingles is based on your medical history and a medical examination, such as whether you have had chickenpox, whether the rash came after the localised pain, and the rash appearance. Laboratory testing and imaging is not usually needed. While shingles cannot be cured, it usually resolves itself within 4 weeks. Until then, there are treatments that can relieve symptoms. Early diagnosis and treatment are very important. Self-care will help ease your symptoms, including keeping the rash clean to reduce infection risk, wearing loose clothing to avoid friction with the skin, and avoiding adhesive dressings and using non-stick dressings only if weeping blisters need to be covered. Applied to affected area, cool compresses may ease the pain, while calamine lotion may help to relieve itching, prevent infection due to scratching, and cause shrinking to limit weeping from blisters. Painkillers such as paracetamol and non-steroidal anti-inflammatory drugs may be used to treat moderate pain, while stronger medicines such as gabapentin or a strong opioid may be necessary to relieve severe pain. PHN may also be relieved by an anaesthetic ointment and analgesic cream. Antiviral drugs act by preventing viral replication. Taken during the first few days of a shingles attack, they can reduce the severity of signs and symptoms, shorten its duration, and lower the risk of PHN and future complications. Varicella-zoster vaccines are available to immunise older people against shingles. The vaccine is not for people who have a weakened immune system caused by a medical condition (e.g., a chronic inflammatory disease or cancer) or treatment (e.g., corticosteroids).